Joy’s Entry – What a lovely name. It is very narrow and connects Ann Street to High Street. 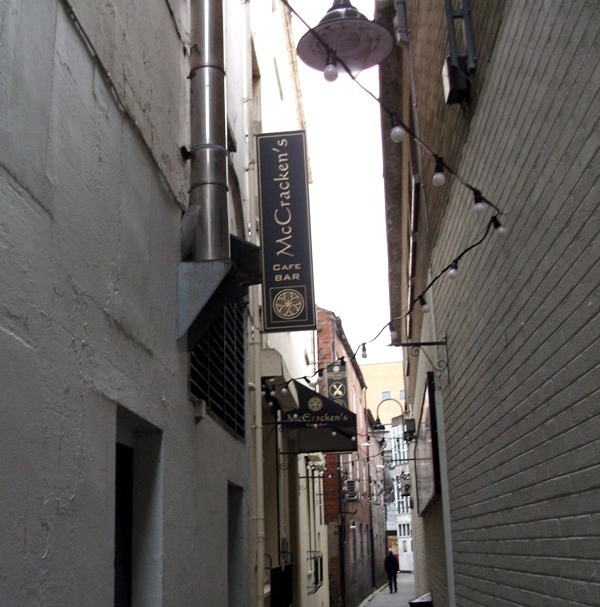 Home to several pubs, such as McCrackens Cafe Bar. The Entry takes its name from the Joy family who were prominent 18th Century residents of the city. Francis McCracken, shipowner, married Anne Joy, daughter of Francis Joy. The Joy family made their money in linen manufacture and Francis Joy McCracken was founder of the Belfast Newsletter in 1737. It was first printed here in Joy’s Entry. Henry Joy McCracken, a grandson of Francis, became interested in radical politics and joined the Society of the United Irishmen in 1795. 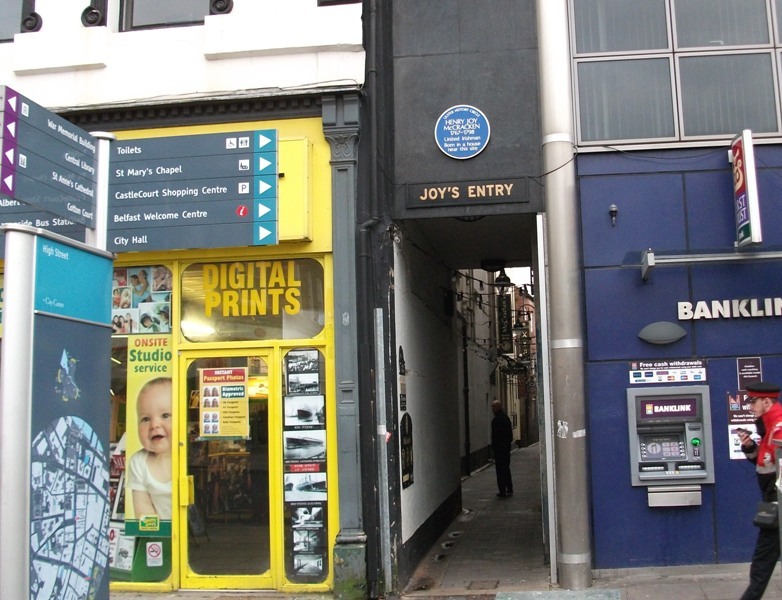 He was court martialled and hanged at Corn Market, Belfast, not many yards from Joy’s Entry in July 1798, on land his grandfather had donated to the city. The best view is from the Ann Street end. This entry was posted in Photography, Travel on January 28, 2012 by Grannymar. A lovely name. There’s also Joy Street and Harmony Street not far away. Interesting. I’ve only seen a couple of places like that in the US, where such a narrow passage would actually be more than a service alley. One that comes to mind is in the old colonial part of Philadelphia. Nick – Is Harmony Street somewhere off Dublin Road? I do know there was a Harmony Hill in Lambeg. Joy Street I need to check on, anything of interest there? Mike – These narrow lanes and entry’s are inherited from a very different world when large families lived in small spaces. I studied Henry Joy McCracken, how ironic he was hanged on his family’s land. WWW – … and at such a young age too! Grannymar, it is indeed – almost opposite the cinema. Joy Street is parallel to Cromac Street. Said to be named after the Joy family who had a paper mill in the area. That’s all I know about it. Nick – Thanks for that info.